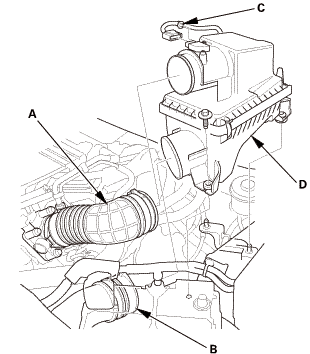 Disconnect the intake air duct (A) and the intake air pipe (B). 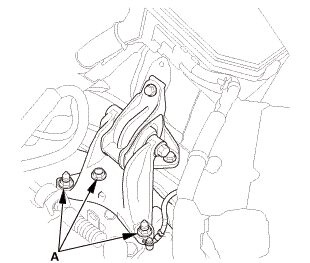 Remove the harness clamp (C). Remove the air cleaner (D). Lift and support the engine with a jack and a wood block under the oil pan. Remove the upper torque rod. 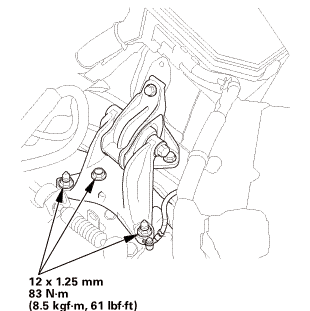 Remove the ground cable (A), the side engine mount bracket (B), and the side engine mount (C). 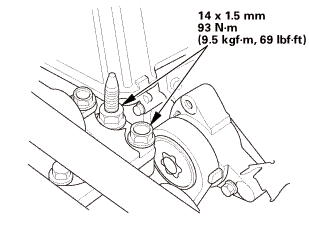 Install the new side engine mount mounting bolts (A) and the side engine mount bracket (B) using a nut and a new bolt, then loosely install the new side engine mount bracket mounting bolts and nut (C). Install the ground cable (D). Remove the jack and the wood block. 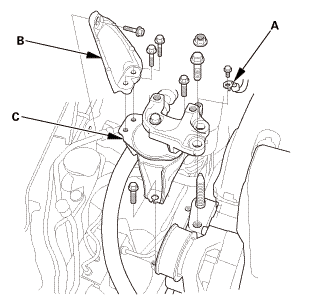 Loosen the transmission mount bracket bolt and nuts (A). 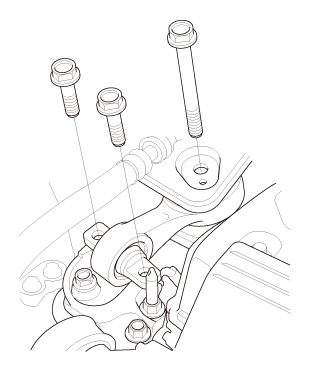 Loosen the lower torque rod mounting bolt (A). Tighten the side engine mount bracket mounting bolt and nut. Tighten the transmission mount bracket mounting bolt and nuts. 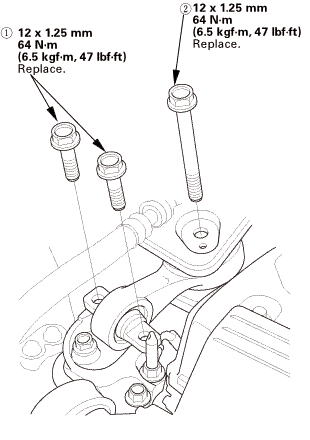 Loosen the lower torque mount mounting bolt. 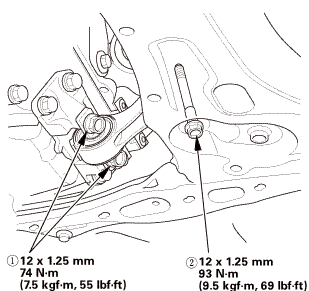 Tighten the lower torque rod mount mounting bolts in the numbered sequence shown. Install the upper torque rod using new bolts. 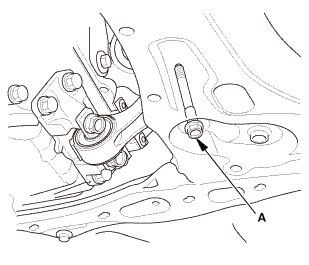 Tighten the upper torque rod mounting bolts in the numbered sequence shown. Install the air cleaner (A). 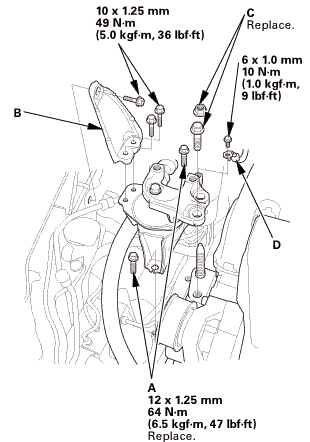 Install the harness clamp (B). 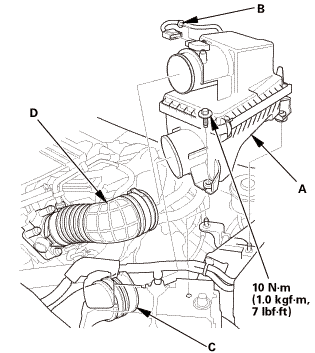 Connect the intake air pipe (C) and the intake air duct (D).